Photo submissions for The CADBURY Bunny Tryouts ended at 11:59:59 PM ET on 3/6/19. Thanks to everyone who submitted their entry. Photo entries will be judged based on judging criteria in official rules and the top 20 semi-finalists will be contacted to submit a video. The Grand Prize winner will be chosen from semi-finalist videos. NO PURCHASE NECESSARY. Open only to legal residents of the United States residing in the 50 United States or District of Columbia, 18 years of age or older at time of entry. Void where prohibited. Contest begins with a Photo Submission Phase from 12:00:01 PM ET on 2/13/19 through 11:59:59 PM ET on 3/6/19. The Photo Submission Phase is followed by a Judging Phase that begins on 3/7/19 at 12:00:01 AM ET and ends 3/7/19 at 12:00:01 PM ET, a Video Submission Phase that begins 3/8/19 at 12:00:01 AM ET and ends 3/10/19 at 11:59:59 PM ET, and a Winner Determination Phase that begins 3/11/19 at 12:00:01 AM ET and ends 3/11/19 at 11:59:59 PM ET. Visit https://bunnytryouts.cadburyusa.com for full Official Rules and complete details, including entry method, entry requirements (including Photo and Video Submission guidelines and requirements), judging criteria and process, winner selection, and prize description and conditions. To win the prize, winning pet featured in Photo Submission and Video Submission must be able to perform for camera and remain reasonably stationary while wearing bunny ears. Sponsor: The Hershey Company, 100 Crystal A Drive, Hershey, PA. Your pet could be in this commercial! 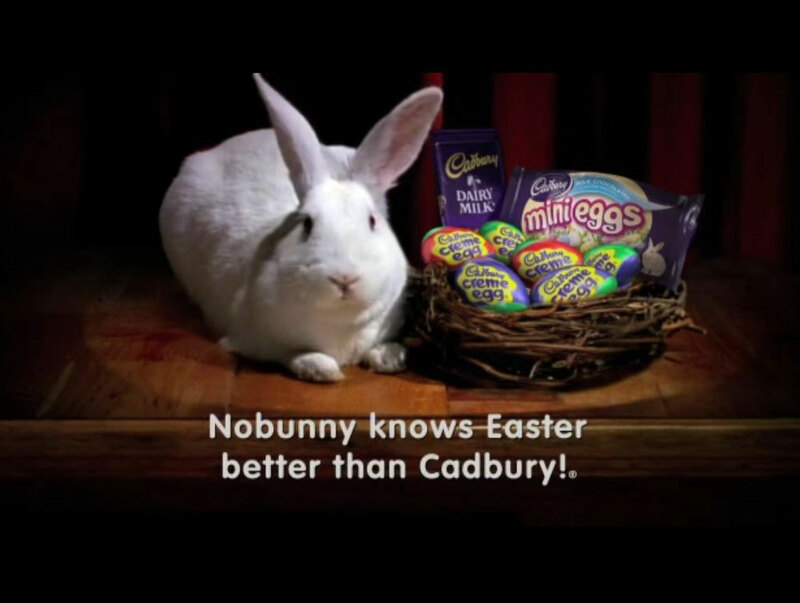 to star in the CADBURY Bunny Commercial this Easter? Photo entries will be judged based on judging criteria in Official Rules and the top 20 semi-finalists will be contacted to submit a video. The Grand Prize winner will be chosen from semi-finalist videos.